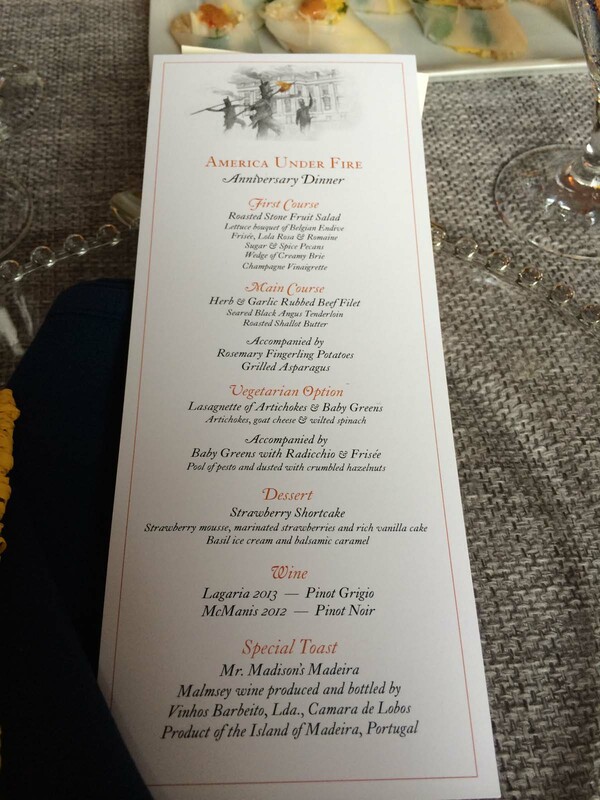 Dinner menu for America Under Fire. It was during the War of 1812 that on August 24, 1814, British forces advanced into Washington, DC. After burning the Capitol the British occupied the White House or President’s House as it was known then. Madeira was James Madison’s favorite wine so it is of no surprise that there were coolers of Madeira waiting in the dining room for President James Madison’s return. The British forces notoriously drank this excellent Madeira before setting fire to the President’s House. This summer I provided an introduction to James Madison and his wine in my post the The 200th Anniversary of the Burning of Washington and the Destruction of President James Madison’s Choice Wines. 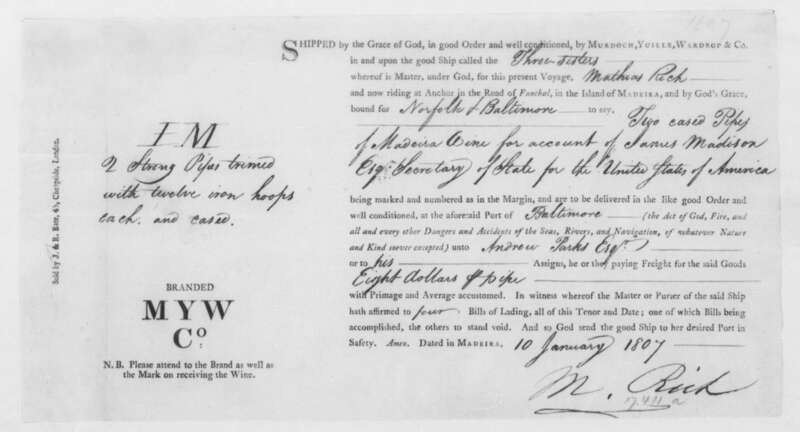 Bill of lading detailing a quarter-cask of Malmsey for James Madison. Christopher Child, May 10, 1809. Bill of Lading, Wine Shipment. The James Madison Papers. Library of Congress. To commemorate this 200th anniversary I collaborated on a fantastic project to recreate the Madeira that the British drank before the burning. Together with Mannie Berk, Rare Wine Company, and Meg Kennedy, Director of Museum Programs at The Montpelier Foundation, we identified a specific Madeira from James Madison’s wine orders. The British descriptions of the Madeira being “super excellent” and “nectar of the gods” led us to choose a rare seven year old Malmsey that James Madison ordered in 1809. With this in mind Ricardo Freitas, Vinhos Barbeito, blended a 2006 Malmsey with a small amount of very old Tinta Negra. Only 450 liters of this wine were produced. The wine was named Mr. Madison’s Madeira in reference to an alternative name for the War of 1812, Mr. Madison’s War. The bottle itself is sealed with wax that was stamped with a recreation of an original James Madison wine seal. 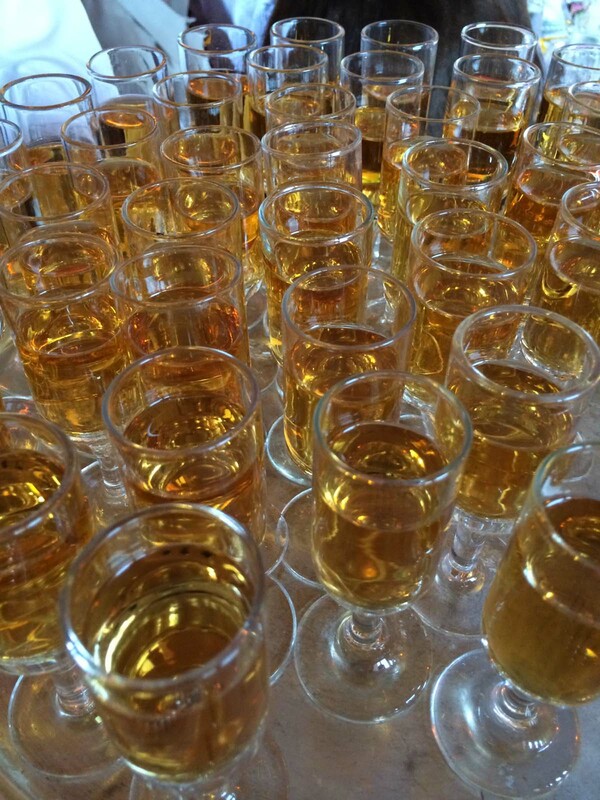 Glasses of Mr. Madison’s Madeira. This summer The White House Historical Association, The United States Capitol Historical Society, and James Madison’s Montpelier organized the America Under Fire Symposium. At the conclusion of the symposium dinner Mr. Madison’s Madeira was served for the commemorative toast. The majority of Mr. Madison’s Madeira was set aside for Montpelier but there is a very small amount available through the latest newsletter of the Rare Wine Company. In my 200th anniversary post I suggested that you offer a commemorative toast with your finest and rarest Madeira. I now suggest you offer another toast this time with Mr. Madison’s Madeira. When you smell and taste the wine realize that this is what recharged the weary British forces before they went outside to set the White House ablaze. During retirement, James Madison preferred to drink the Madeira he “put away in the pediment of the portico…above all new importations”. These were the bottles he purposely stored in the attic of Montpelier, his home in Virginia. James Madison also had “several large wine cellars” full of “old-fashioned wines” in the basement of Montpelier. This storage preference is telling because it illustrates an appreciation of flavor affected by the cycling of temperature throughout the year over the stable development in a wine cellar. James Madison’s father also stored his Madeira “in the wall” so it is possible this preference developed early in life. A letter to James Madison from a local wine merchant encapsulates what were considered important attributes for Madeira. 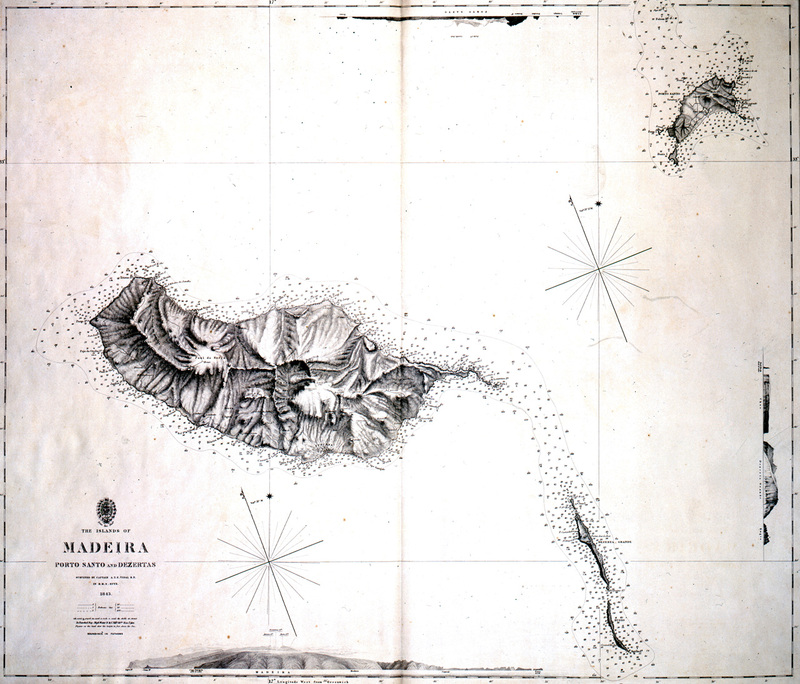 The letter states that the agents would “pay strict attention to your directions as to the body, flavor, [&] Color of the wine.” These were actually widespread concerns meant to address geographically different preferences for Madeira. While living in Washington, DC, James Madison could have readily purchased all of his wine from merchants in Georgetown and Alexandria but instead he chose to specifically order his Madeira. I suspect he was looking for certain qualities in his favorite drink, Madeira. While we do not yet know what James Madison’s specific importations of Madeira looked, smelled, and tasted like, it is possible to form a general idea. To do so, it is helpful to broaden the correspondence reviewed. 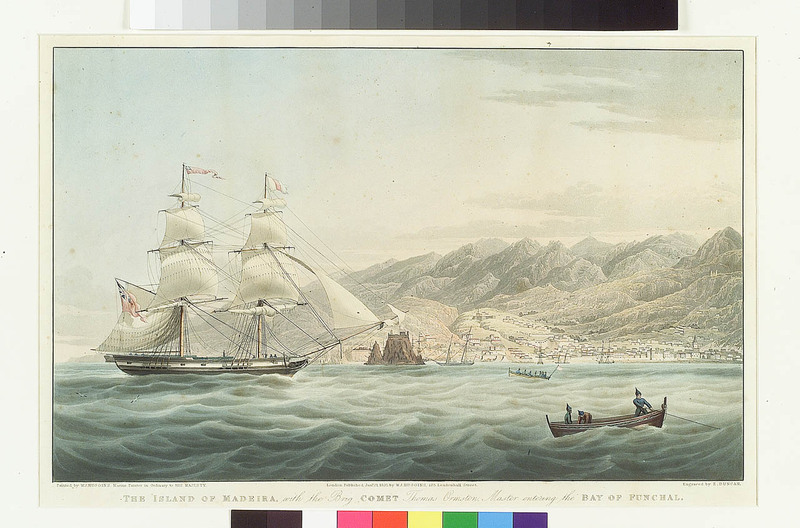 The Island of Madeira with the Brig Comet Thomas Ormston Master entering the Bay of Funchal. 1831. Copyright National Maritime Museum, London. James Madison did not drink his Madeira straight from cask. After letting the cask age and settle he preferred to bottle the Madeira for further aging. He felt that this was the ideal “mode of compleating its flavour.” He wrote that “wine is said to attain its perfection best by lying 5 or 6 years in Cask, and then going into bottles and kept throughout in warm situations.” James Madison found that a particular parcel of Madeira which he had bottled then stored in the garret or attic for 18 months had become “exquisite”. Advertisement for “old south side Madeira Wine”. Date: Monday, July 24, 1815 Paper: Baltimore Patriot (Baltimore, MD) Volume: VI Issue: 798 Page: 3. James Madison was succinct in describing the Madeira he particularly enjoyed. In one case, two pipes of 1800 Madeira were sourced from the private stock of Don Jao de Carvahal. Described as the “richest man” on the Madeira island the wine came from “the best plantations”. Tasted at 11 years of age, James Madison found the Madeira “proved very satisfying” and that the pipes “seem to be unusually fine and well flavored”. He naturally requested two more pipes. The quality of this Madeira was due to it being “pure” unmixed south-side Madeira from a good old vintage. The vintages of 1808-1811 were “remarkably bad” forcing merchants to mix “new & north wines with the old south” to ripen during the sea voyage. 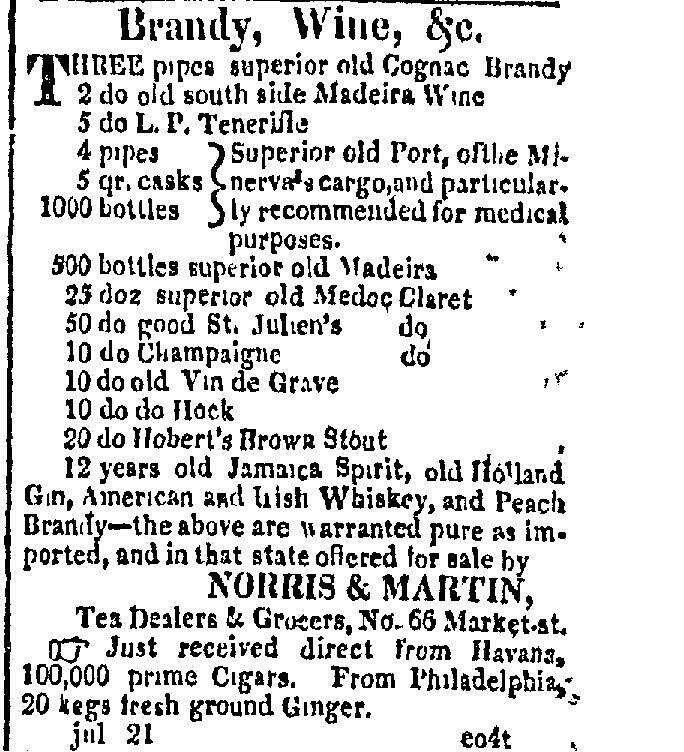 James Madison ordered a wide variety of Madeira such as London Market, London Particular, Malmsey, Sercial, and Terita [sic]. While there is not enough surviving documentation to learn what all of these wines were like, it is clear that James Madison enjoyed the flavor of Madeira affected by age. As one guest of James Madison wrote in 1816, the “Madeira that he purchased in Philadelphia in :96 made a part of every day’s fare!”. “To James Madison from Adams Herbert and Company, 3 May 1816,” Founders Online, National Archives (http://founders.archives.gov/documents/Madison/99-01-02-5116, ver. 2014-05-09). Source: this is an Early Access document from The Papers of James Madison. It is not an authoritative final version. “To George Washington from Hill, Lamar & Hill, 28 March 1760,” Founders Online, National Archives (http://founders.archives.gov/documents/Washington/02-06-02-0219, ver. 2014-05-09). Source: The Papers of George Washington, Colonial Series, vol. 6, 4 September 1758 – 26 December 1760, ed. W. W. Abbot. Charlottesville: University Press of Virginia, 1988, pp. 404–405. “To Benjamin Franklin from Thomas Wharton, 18 November 1767,” Founders Online, National Archives (http://founders.archives.gov/documents/Franklin/01-14-02-0189, ver. 2014-05-09). Source: The Papers of Benjamin Franklin, vol. 14, January 1 through December 31, 1767, ed. Leonard W. Labaree. New Haven and London: Yale University Press, 1970, pp. 310–311. “To Thomas Jefferson from Adam Lindsay, 12 April 1792,” Founders Online, National Archives (http://founders.archives.gov/documents/Jefferson/01-23-02-0361, ver. 2014-05-09). Source: The Papers of Thomas Jefferson, vol. 23, 1 January–31 May 1792, ed. Charles T. Cullen. Princeton: Princeton University Press, 1990, pp. 409–410. 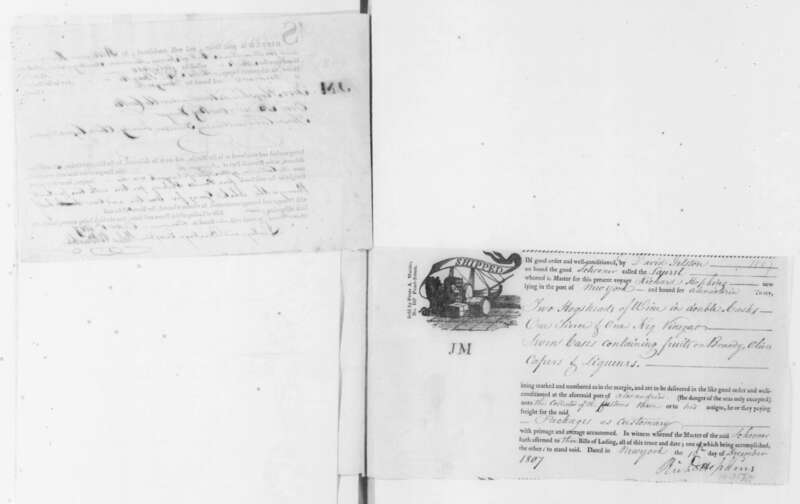 “To Thomas Jefferson from Joseph Yznardi, Sr., 12 February 1802,” Founders Online, National Archives (http://founders.archives.gov/documents/Jefferson/01-36-02-0375, ver. 2014-05-09). Source: The Papers of Thomas Jefferson, vol. 36, 1 December 1801–3 March 1802, ed. Barbara B. Oberg. Princeton: Princeton University Press, 2009, pp. 572–573. “To Thomas Jefferson from Joseph Yznardi, Sr., 30 January 1802,” Founders Online, National Archives (http://founders.archives.gov/documents/Jefferson/01-36-02-0307, ver. 2014-05-09). Source: The Papers of Thomas Jefferson, vol. 36, 1 December 1801–3 March 1802, ed. Barbara B. Oberg. Princeton: Princeton University Press, 2009, pp. 482–484. “From James Madison to William Jarvis, 30 October 1807,” Founders Online, National Archives (http://founders.archives.gov/documents/Madison/99-01-02-2276, ver. 2014-05-09). Source: this is an Early Access document from The Papers of James Madison. It is not an authoritative final version. “To James Madison from Anthony-Charles Cazenove, 13 July 1815,” Founders Online, National Archives (http://founders.archives.gov/documents/Madison/99-01-02-4510, ver. 2014-05-09). Source: this is an Early Access document from The Papers of James Madison. It is not an authoritative final version. 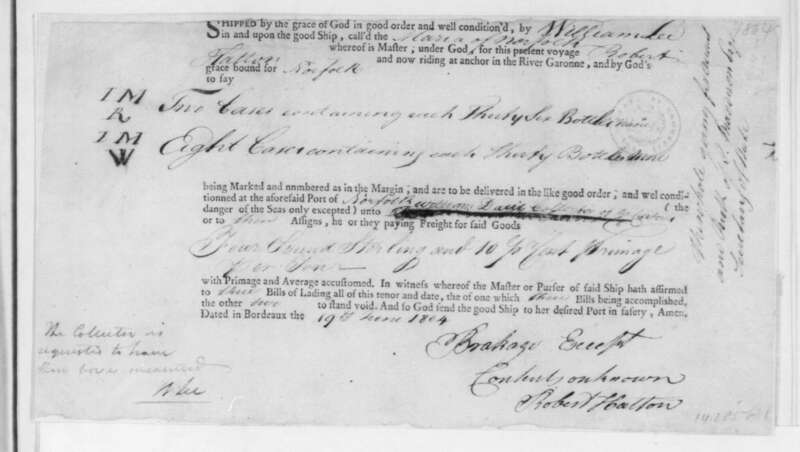 “From George Washington to John and James Searle, 30 April 1763,” Founders Online, National Archives (http://founders.archives.gov/documents/Washington/02-07-02-0127 [last update: 2014-09-30]). Source: The Papers of George Washington, Colonial Series, vol. 7, 1 January 1761 – 15 June 1767, ed. W. W. Abbot and Dorothy Twohig. Charlottesville: University Press of Virginia, 1990, p. 208. “From Thomas Jefferson to Stephen Cathalan, Jr., 26 May 1819,” Founders Online, National Archives (http://founders.archives.gov/documents/Jefferson/98-01-02-0434 [last update: 2014-09-30]). Source: this is an Early Access document from The Papers of Thomas Jefferson: Retirement Series. It is not an authoritative final version. “From James Madison to Isaac Hite, 15 December 1804,” Founders Online, National Archives (http://founders.archives.gov/documents/Madison/02-08-02-0403 [last update: 2014-09-30]). Source: The Papers of James Madison, Secretary of State Series, vol. 8, 1 September 1804 – 31 January 1805 and supplement 1776 – 23 June 1804, ed. Mary A. Hackett, J. C. A. Stagg, Mary Parke Johnson, Anne Mandeville Colony, Angela Kreider, Jeanne Kerr Cross, and Wendy Ellen Perry. Charlottesville: University of Virginia Press, 2007, p. 381. “From James Madison to Francis Corbin, 28 May 1817,” Founders Online, National Archives (http://founders.archives.gov/documents/Madison/04-01-02-0051 [last update: 2014-09-30]). Source: The Papers of James Madison, Retirement Series, vol. 1, 4 March 1817 – 31 January 1820, ed. David B. Mattern, J. C. A. Stagg, Mary Parke Johnson, and Anne Mandeville Colony. Charlottesville: University of Virginia Press, 2009, pp. 52–53. “To James Madison from Thomas Newton, 28 November 1806,” Founders Online, National Archives (http://founders.archives.gov/documents/Madison/99-01-02-1118 [last update: 2014-09-30]). Source: this is an Early Access document from The Papers of James Madison. It is not an authoritative final version. “To James Madison from James Leander Cathcart, 13 August 1810 (Abstract),” Founders Online, National Archives (http://founders.archives.gov/documents/Madison/03-02-02-0594 [last update: 2014-09-30]). Source: The Papers of James Madison, Presidential Series, vol. 2, 1 October 1809–2 November 1810, ed. J. C. A. Stagg, Jeanne Kerr Cross, and Susan Holbrook Perdue. Charlottesville: University Press of Virginia, 1992, p. 483. “From James Madison to James Leander Cathcart, 28 May 1811 (Abstract),” Founders Online, National Archives (http://founders.archives.gov/documents/Madison/03-03-02-0371 [last update: 2014-09-30]). Source: The Papers of James Madison, Presidential Series, vol. 3, 3 November 1810–4 November 1811, ed. J. C. A. Stagg, Jeanne Kerr Cross, and Susan Holbrook Perdue. Charlottesville: University Press of Virginia, 1996, p. 320. The Treaty of Ghent marked the end of the War of 1812 which was fought between the United States of America and Great Britain. The treaty was signed on December 24, 1814, just several months after invading British forces burned the Capitol and President’s House. Amongst the losses from the burning was the destruction of James Madison’s presidential wine cellar. President James Madison’s wine orders continued to be shipped after the burning. One shipment of wine was sent immediately after the signing of the Treaty of Ghent. It consisted of a box, presumably of Bordeaux wine. This box was placed onboard the U.S. schooner Transit which famously bore a copy of the Treaty of Ghent escorted by Christopher Hughes Jr. Christopher Hughes Jr. was carrying one of three copies of the treaty that were redundantly sent back to Washington, DC, for signing by Congress. James Madison’s Montpelier. 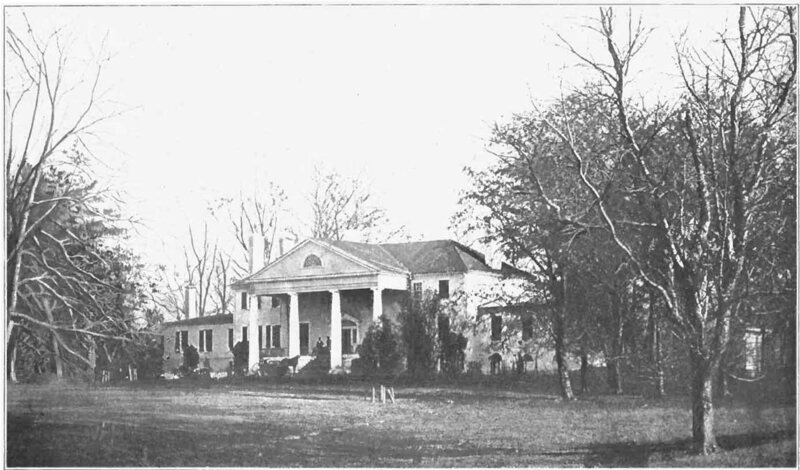 c. 1914. Image from Wikimedia. The box of wine never made it to President James Madison for it was drunk aboard the schooner. It was subsequently replaced with wine Christopher Hughes Jr. purchased in Bordeaux. I suspect he needed extra wine to celebrate the end of war during the long journey across the Atlantic Ocean. It would not be by accident that Christopher Hughes Jr. was involved with the consumption of President James Madison’s box of wine. Christopher Hughes Jr. would have known what he was drinking the President’s wine because the box would have been marked to identify both the shipper of the wine and the recipient. The wines of James Madison were transported and stored in both wooden casks and bottles. His wine was ordered both within America and from Europe. In both cases the long journey involved stages of transit and storage, both of which could involve loss from theft, adulteration, or damage. James Madison was aware of this danger and even took the time to write James Monroe to secure his wine against “every species of casualty by land as well as by water”. The packaging and marking of the wine thus depended upon the container. A cask of wine contains a hole for filling and draining the wine. The hole is sealed with a bung or stopper which meant that a thief could pry open the bung to access the wine. In one instance a cask of James Madison’s wine was drained then “filled up with Water” by seamen. To prevent such theft James Madison wrote to his father in 1792 that a cask was to be placed inside a wood case to “secure it against fraud”. James Madison continued to employ casing for his casks of fine wine. His 1807 order of “finest old Madeira wine” involved an extra charge of £1 20s. for each of the cases. To secure the wine from damage these “strong” casks were “trimmed with twelve iron hoops each”. While James Madison typically cased his casks his order of two hogsheads of “old Cantenac wine” were placed in “double casks”. This involved removing the head of a larger, empty cask then slipping the cask of wine inside and padding it, perhaps with straw. Wine in bottle was shipped in wood boxes. The boxes held different numbers of bottles no doubt partially dependent upon the bottle being a pint, quart, or flask. One box of old “Rhenish Wine” contained 60 bottles. Another shipment that year involved cases of both 30 and 36 bottles. Improperly packed cases resulted in broken bottles. Casks, bottles, and boxes were not marked with paper labels as they are now. To identify the casks and boxes they would bear both brands and marks. Together this would distinguish individual wines within a single order as well as the order from the property of others. 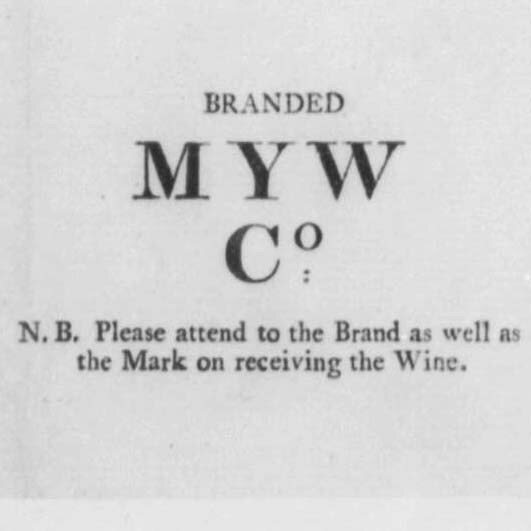 Thus the previously mentioned 1807 order of “finest old Madeira wine” was branded with “MYW CO:” for the shipper Murdoch, Yuille, Wardrop & Co. and marked with “JM” for James Madison. 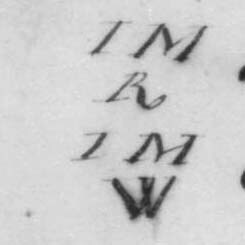 A combined order of Sherry for both Thomas Jefferson and James Madison was marked on the casks and cases with “PX” for President Thomas Jefferson and “M” for James Madison. The same letter did indicate that “the Young Gentleman” who cased the casks did not look at the marks thus “the Case must therefore be removed from one before it Can be discovered to whom each belongs.” A later order of “old Madeira wine” involved two casks and one quarter-cask all of which were cased. The casks were not only marked “JM” and branded “IL Cathcart” but painted. Unfortunately, there is no indication of color! Wine bottles were marked by other means. When an order of Madeira in pipes was bottled for both James Madison and James Munroe, a string was tied around James Munroe’s bottles. It was noted that the dregs of the Madeira from the bottom of the pipes were in bottles that were “corked in the common Way.” It is possible these bottles only had the corks driven in whereas the other bottles had the corks sealed with wax. We know James Madison was familiar with wax for his 1802 “white Hermitage wine, Cortillon” bore yellow wax seals. In one order, the bottles of “Old Chateau Margaux” were “marked with a wafer on the bottom of the bottle.” It is possible this mark refers to wafer seals that were typically used to seal letters. They were made from a paste that was often colored, dried, and cut into a circle. Once wet it could be applied to a surface, in this case the bottom of a wine bottle. Being that the wines were old the corks could have already been sealed with wax so the wafer was used to distinguish James Madison’s order. Unfortunately, there are no related documents at Chateau Margaux so we do not know if this was a common or uncommon practice. It is noted that in the same order the 73 bottles of Clos de Vougeot were “marked on the cork”. This order took place in 1811 and is a fantastic description because it is the earliest reference I can find to the marking of corks for bottles of wine in America. From my Murder & Thieves series we know that private individuals were marking their corks as far back as 1762 in London. The only other early American reference I am aware dates to 1844. When it came to drinking Madeira, James Madison preferred to drink from a bottle rather than straight from the cask. He would have bottled his wine in the cellar of Montpelier, his Virginia home, or at the President’s House. These bottles would be stored for some time including one parcel that spent 18 months in his garret at Montpelier. Archaeological excavations have revealed bottle fragments both from Mount Pleasant, the first Madison family home at Montpelier, and around the second family home, the Montpelier mansion. James Madison’s father, James Madison Sr., used wine bottles that had personalized glass seals on them. Some of the seals bore his initials and others his name. James Madison used wine bottle seals as well. Unfortunately, we do not know how James Madison organized his bottles. There are no surviving orders for wine bottles, corks, and sealing wax nor descriptions of how he marked his bottles. Wine bottle seals were useful in distinguishing privately bottled wine from that which was purchased in bottle. So it is possible James Madison employed various methods such as color coded wax, chalk marks on bottles, and even tags tied on with strings to identify his own bottled wine. “To James Madison from William Lee, 6 September 1815,” Founders Online, National Archives (http://founders.archives.gov/documents/Madison/99-01-02-4638, ver. 2014-05-09). Source: this is an Early Access document from The Papers of James Madison. It is not an authoritative final version. “From James Madison to James Monroe, 20 July 1799,” Founders Online, National Archives (http://founders.archives.gov/documents/Madison/01-17-02-0163, ver. 2014-05-09). Source: The Papers of James Madison, vol. 17, 31 March 1797–3 March 1801 and supplement 22 January 1778–9 August 1795, ed. David B. Mattern, J. C. A. Stagg, Jeanne K. Cross, and Susan Holbrook Perdue. Charlottesville: University Press of Virginia, 1991, pp. 254–255. “To James Madison from William Jarvis, 25 February 1809,” Founders Online, National Archives (http://founders.archives.gov/documents/Madison/99-01-02-4069, ver. 2014-05-09). Source: this is an Early Access document from The Papers of James Madison. It is not an authoritative final version. “From James Madison to James Madison, Sr., 17 April 1792,” Founders Online, National Archives (http://founders.archives.gov/documents/Madison/01-14-02-0262, ver. 2014-05-09). Source: The Papers of James Madison, vol. 14, 6 April 1791 – 16 March 1793, ed. Robert A. Rutland and Thomas A. Mason. Charlottesville: University Press of Virginia, 1983, pp. 290–291. “To James Madison from Murdoch Yuille Wardrop and Company, 10 January 1807,” Founders Online, National Archives (http://founders.archives.gov/documents/Madison/99-01-02-1271, ver. 2014-05-09). Source: this is an Early Access document from The Papers of James Madison. It is not an authoritative final version. “To James Madison from Frederick Jacob Wichelhausen, 4 April 1804 (Abstract),” Founders Online, National Archives (http://founders.archives.gov/documents/Madison/02-07-02-0009, ver. 2014-05-09). Source: The Papers of James Madison, Secretary of State Series, vol. 7, 2 April–31 August 1804, ed. David B. Mattern, J. C. A. Stagg, Ellen J. Barber, Anne Mandeville Colony, Angela Kreider, and Jeanne Kerr Cross. Charlottesville: University of Virginia Press, 2005, pp. 4–5. “To James Madison from Chandler Price, 14 December 1804,” Founders Online, National Archives (http://founders.archives.gov/documents/Madison/02-08-02-0399, ver. 2014-05-09). Source: The Papers of James Madison, Secretary of State Series, vol. 8, 1 September 1804 – 31 January 1805 and supplement 1776 – 23 June 1804, ed. Mary A. Hackett, J. C. A. Stagg, Mary Parke Johnson, Anne Mandeville Colony, Angela Kreider, Jeanne Kerr Cross, and Wendy Ellen Perry. Charlottesville: University of Virginia Press, 2007, p. 378. “To James Madison from James Yard, 28 October 1800,” Founders Online, National Archives (http://founders.archives.gov/documents/Madison/01-17-02-0277, ver. 2014-05-09). Source: The Papers of James Madison, vol. 17, 31 March 1797–3 March 1801 and supplement 22 January 1778–9 August 1795, ed. David B. Mattern, J. C. A. Stagg, Jeanne K. Cross, and Susan Holbrook Perdue. Charlottesville: University Press of Virginia, 1991, pp. 429–430. “To James Madison from Stephen Cathalan, Jr., 5 November 1806,” Founders Online, National Archives (http://founders.archives.gov/documents/Madison/99-01-02-1043, ver. 2014-05-09). Source: this is an Early Access document from The Papers of James Madison. It is not an authoritative final version. 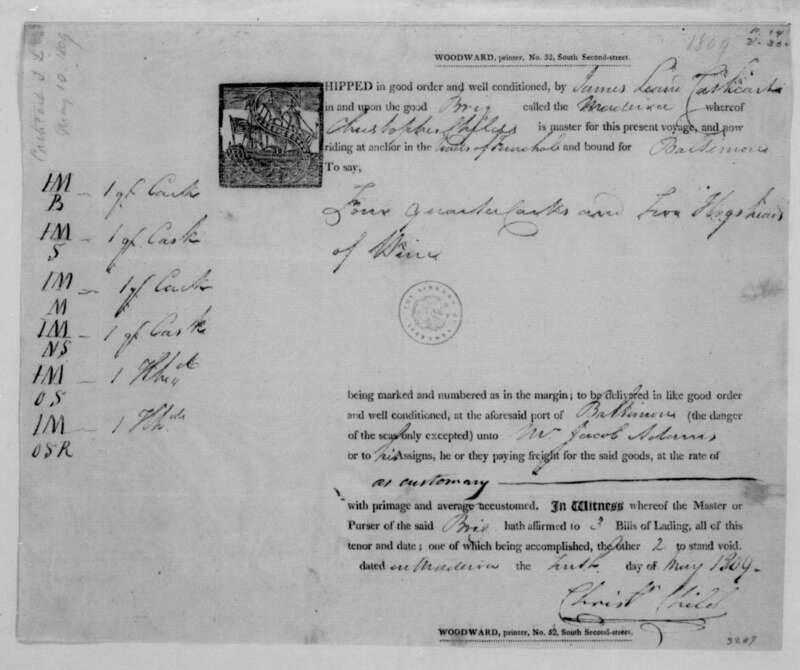 “Account with Joel Barlow, 12 June 1811 (Abstract),” Founders Online, National Archives (http://founders.archives.gov/documents/Madison/03-03-02-0395, ver. 2014-05-09). Source: The Papers of James Madison, Presidential Series, vol. 3, 3 November 1810–4 November 1811, ed. J. C. A. Stagg, Jeanne Kerr Cross, and Susan Holbrook Perdue. Charlottesville: University Press of Virginia, 1996, p. 340. Per email from Johana Loubet, External Relations Manager, Chateau Margaux. October 21, 2014. “From James Madison to Francis Corbin, 28 May 1817,” Founders Online, National Archives (http://founders.archives.gov/documents/Madison/04-01-02-0051, ver. 2014-05-09). Source: The Papers of James Madison, Retirement Series, vol. 1, 4 March 1817 – 31 January 1820, ed. David B. Mattern, J. C. A. Stagg, Mary Parke Johnson, and Anne Mandeville Colony. Charlottesville: University of Virginia Press, 2009, pp. 52–53. “From James Madison to Isaac Hite, 15 December 1804,” Founders Online, National Archives (http://founders.archives.gov/documents/Madison/02-08-02-0403, ver. 2014-05-09). Source: The Papers of James Madison, Secretary of State Series, vol. 8, 1 September 1804 – 31 January 1805 and supplement 1776 – 23 June 1804, ed. Mary A. Hackett, J. C. A. Stagg, Mary Parke Johnson, Anne Mandeville Colony, Angela Kreider, Jeanne Kerr Cross, and Wendy Ellen Perry. Charlottesville: University of Virginia Press, 2007, p. 381. This post stems from a larger research project into the history of Madeira. Through this work I have generously received the help of Mannie Berk, Founder of the Rare Wine Co., Meg Kennedy, Director of Museum Programs at The Montpelier Foundation, Anna Berkes, Research Librarian at The Thomas Jefferson Foundation, and Dr. William Bushong, Vice President at the White House Historical Association. 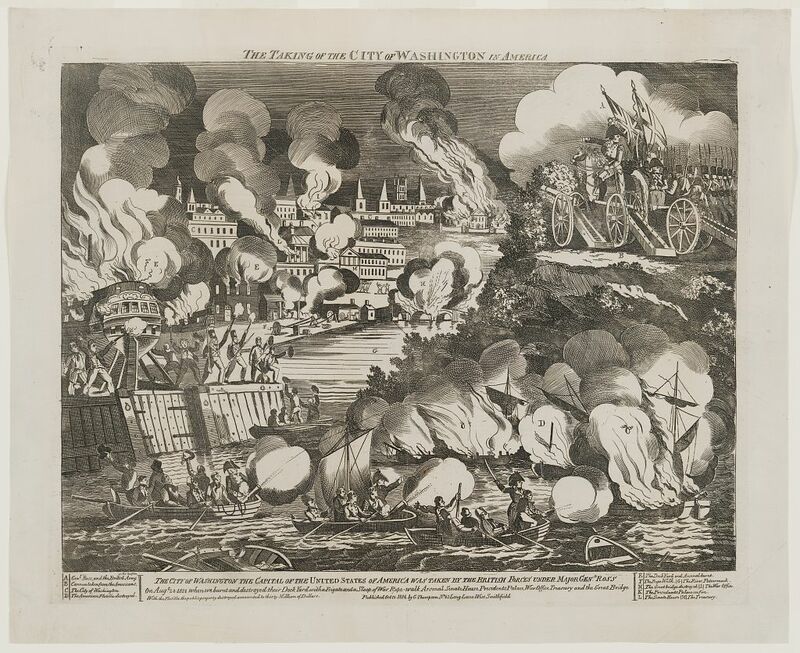 The taking of the city of Washington in America. Smithfield, West. October 14, 1814. Library of Congress Prints and Photographs Division. It was 200 years ago on August 24, 1814, that during the War of 1812 between the United States of America and Great Britain, British forces entered Washington, DC. After setting fire to the Capitol they marched down Pennsylvania Avenue towards the White House or President’s House as it was known then. The last guards of the President’s House fled just minutes before the British arrived. The British entered the house without resistance to find the President’s dining room table set for a meal with a “large store of super-excellent Madeira and other costly wines” cooling on ice. It was evening and the men were surely tired and hungry. One officer found that “never was nectar more grateful to the palates of the gods, than the crystal goblet of Madeira and water”. 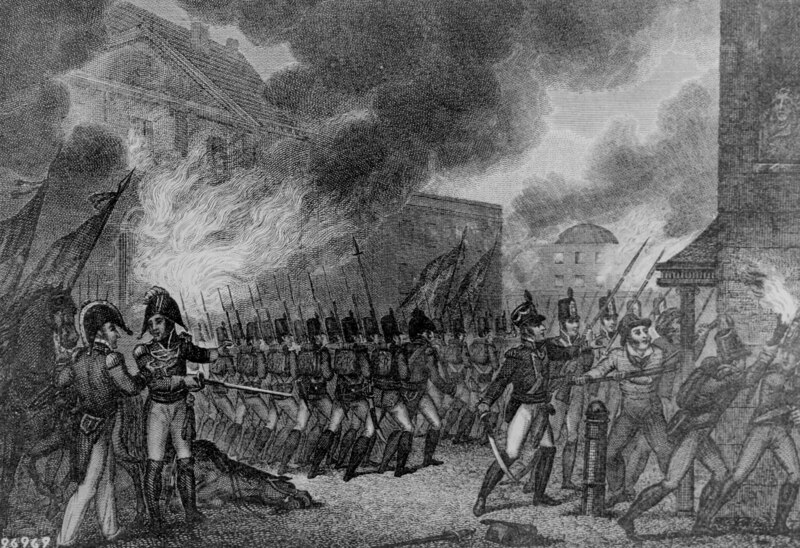 After being satisfied by the wines the British forces set the President’s House on fire. The house burned to a shell after several hours. President James Madison attended the fighting in nearby Maryland earlier that day. Dolly Madison ordered that dinner was to be served at the usual time of 3pm. Despite the fear for occupation, members of the Cabinet and military were still expected to dine that afternoon. It was customary to serve wine with dinner. Paul Jennings, the personal servant and slave of President James Madison, “brought up the ale, cider, and wine, and placed them in the coolers”. That evening the British did not just consume the chilled wine in the dining room; by burning the President’s House they destroyed President James Madison’s treasured wines. One account records that “about $80,000 worth of [wine]” was destroyed. This staggering amount surely exaggerates the financial loss given that Thomas Jefferson spent just over $16,500 during his two terms as President. Still, the amount highlights the magnitude of the physical loss. The wines for dinner would have retrieved from the wine cellar. This cellar was created when Thomas Jefferson built the West Pavilion and incorporated the existing ice house into the structure. The ice house had two levels. The bottom level was located underground and had stone walls to help keep the ice cool. The wine cellar is believed to have been the top level which was separated from the ice by a wooden floor. Here the wine would have been kept cool by the ice below. Between consumption and the burning of the wine cellar only one demijohn of “pure wine” is known to have survived that night. News of the loss reached James Leander Cathcart, an American consul in Madeira who shipped wine to James Madison. Upon returning to Washington, DC, James Leander Cathcart brought a fresh supply of wine “upon a supposition that your stock was burn’t by the Goths”. We do not know which specific wines the British drank. James Madison did not keep any sort of cellar book so there is no record of the bottles Paul Jennings brought up. Fortunately, there is a healthy set of correspondence detailing wine orders, shipping inventories, and bills of lading. These documents detail James Madison’s taste for wine largely beginning in 1800, the year before he became Secretary of State under President Thomas Jefferson. This correspondence has largely been ignored when it comes to the history of wine. In fact, many of the documents are only presented online in abstracted form. It is fortunate then that the digital images of the original papers are accessible through the Library of Congress. Some of these papers contain important information never before placed in the context of the history of wine. 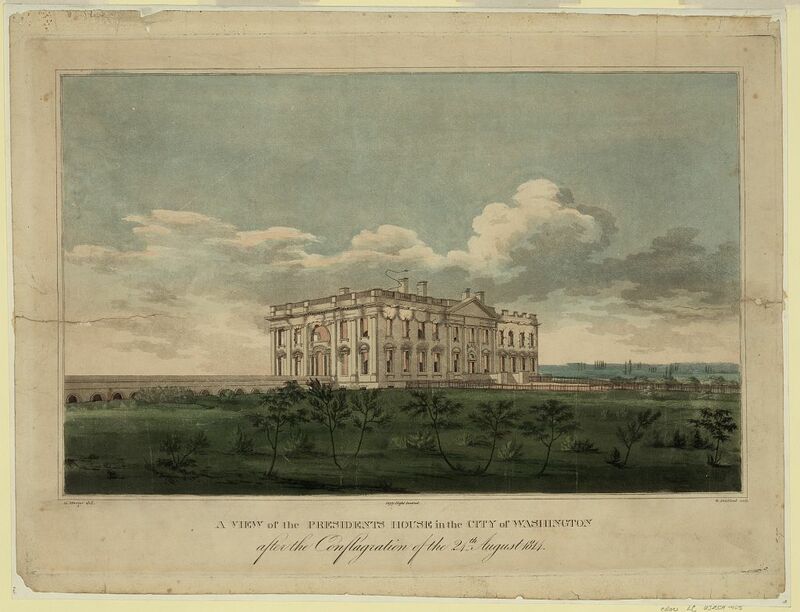 A view of the Presidents house in the city of Washington after the conflagration of the 24th August 1814. Strickland, William. 1814. Library of Congress Prints and Photographs Division. James Madison. Vanderlyn, John. 1816. Google Art Project. James Madison not only had a taste for Madeira but he also had a preference for how to treat it. He felt it should lie in cask for five to six years then bottled and stored in a warm location. When it was bottled the Madeira was best drawn clear from a stationary cask instead of adding ingredients to remove the dead yeast or lees. James Madison felt that further aging in bottle was important in “compleating its flavor.” Madeira connoisseurs commonly aged their precious bottled vintages in garrets to keep them warm. James Madison made use of the pediment of the portico at Montpelier, his Virginia home. Perhaps he even did the same at the President’s House. Madeira was not the only wine James Madison served at Montpelier and the President’s House. He purchased casks and bottles of Burgundy, Champagne, Claret, Hock, Port, and even Spanish “Granache White Wine”. He even tried to order a cask of Algerian wine but the shipping difficulties during the War of 1812 prevented its arrival. A few of his Bordeaux wines include top growths and very old vintages. These examples include 1798 Chateau Haut-Brion red, “Haut Brion petit Sauterne”, “Old Chateaux Margaux” that had been in bottle for five years, and Chateau “Langon” that had been in bottle 25 or 30 years. The order of “Haut Brion petit Sauterne” is of particular importance. The invoice for this wine is dated June 20, 1804, which falls during the period when Charles Maurice de Talleyrand-Périgord owned Chateau Haut-Brion. Charles Maurice de Talleyrand-Périgord, a French diplomat who served under Napoléon Bonaparte, had a taste for sweet and soft wines. While it was known that he produced a Haut-Brion white wine, it was unknown if it was a dry or sweet wine. I forwarded the documentation to Alain Puginier, Historian at Domaine Clarance Dillon which owns Chateau Haut-Brion. Alain Puginier now considers it as fact that the white wine was sweet. It is amazing to think that this detail was hidden in James Madison’s papers for 210 years! Joel Barlow to James Madison, June 12, 1811. Account. Library of Congress. Other interesting details may be found in James Madison’s correspondence. Wine bottles were not labeled at the time so they were identified by other means. When James Yard bottled pipes of Madeira belonging to James Monroe and James Madison, he identified the former bottles by tying a string around the neck. Several years later Stephen Cathalan Junior identified the 1802 “white Hermitage wine, Cortillon” by their yellow wax seals. The previously described bottles of “Old Chateau Margaux” were “marked with a wafer on the bottom of the bottle.” This mysterious mark could imply a small glass disc or wax disc was attached to the bottom. In the same invoice, the 73 bottles of Clos de Vougeot were “marked on the cork”. This is of particular importance because it might be the earliest mention of marked corks in America. 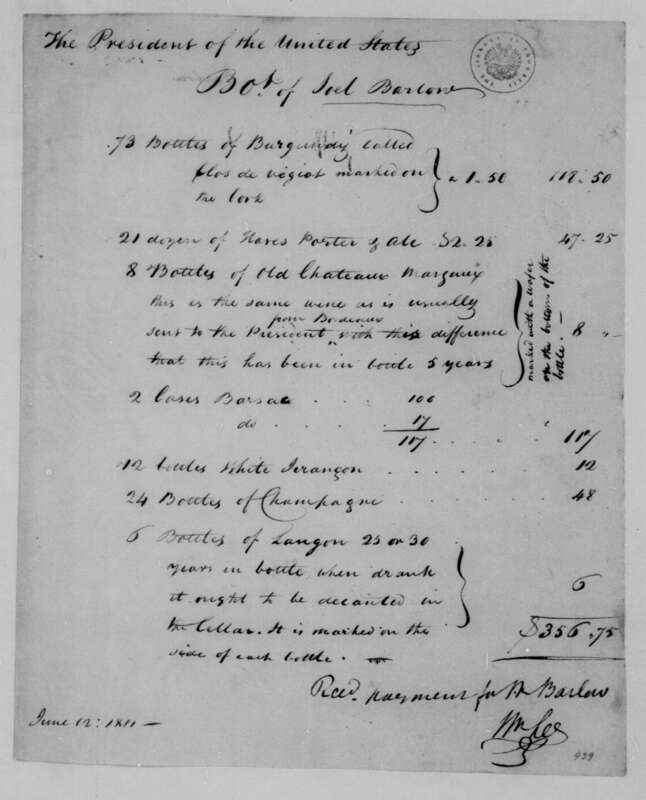 We must turn to these invoices and bills of lading to guess which Madeira the British drank in President James Madison’s dining room. 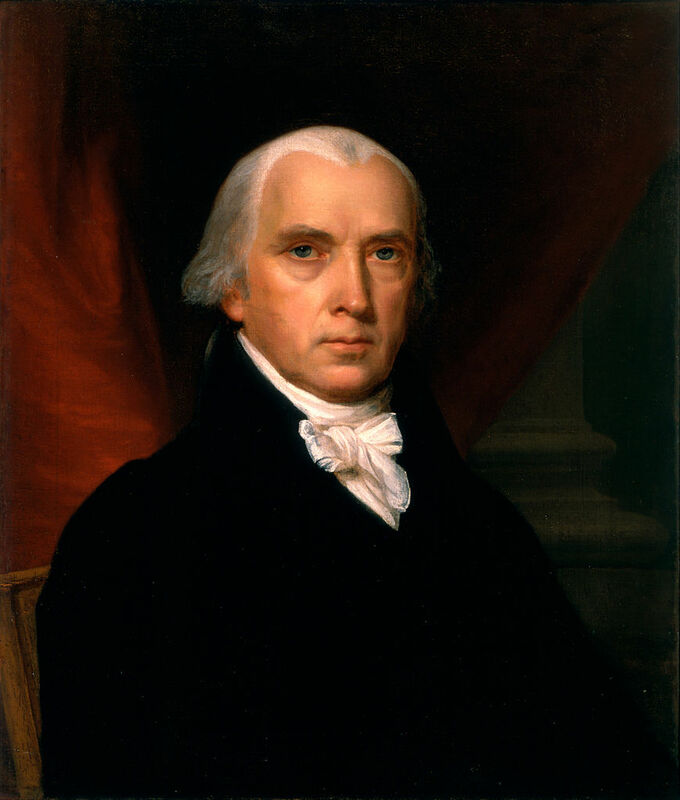 President James Madison placed several orders for Madeira in the years leading up to the Burning of Washington. These include the commonly available London Particular and London Market Madeira. In taking the descriptions of “super excellent” and “nectar of the gods” as a guide than one particular order stands out. This order was placed with James Leander Cathcart during 1809. It includes such Madeira as the “very scarce” Sercial, “scarce” “Terita or Madeira Burgundy”, and Malmsey. Further evidence to the rarity of these wines exists because they were shipped in quarter-casks instead of the larger hogsheads. Pitch, Anthony S. The Burning of Washington: The British Invasion of 1814. Naval Institute Press. 1998. Seale. William. The President’s House, Volume 1. White House Historical Association. 2008. Ann Maury, Diary entry, June 16, 1831, Diary of Ann Maury [manuscript] 1827-1832 , MS 949, Special Collections, University of Virginia Library, Charlottesville, Virginia, MRD-S 122. Philips-Schrock, Patrick. The White House: An Illustrated Architectural History. 2013. Gaillard Hunt (editor) and Margaret Bayard Smith, Margaret Bayard Smith, The First Forty Years of Washington Society: Portrayed by the Family Letters of Mrs. Samuel Harrison Smith (New York, NY: Charles Scribner’s Sons, 1906), p. 110, MRD-S 121. “To James Madison from William Lee, 25 October 1803,” Founders Online, National Archives (http://founders.archives.gov/documents/Madison/02-05-02-0582, ver. 2014-02-12). Source: The Papers of James Madison, Secretary of State Series, vol. 5, 16 May–31 October 1803, ed. David B. Mattern, J. C. A. Stagg, Ellen J. Barber, Anne Mandeville Colony, and Bradley J. Daigle. Charlottesville: University Press of Virginia, 2000, pp. 575–577. “To James Madison from Chandler Price, 14 December 1804,” Founders Online, National Archives (http://founders.archives.gov/documents/Madison/02-08-02-0399, ver. 2014-02-12). Source: The Papers of James Madison, Secretary of State Series, vol. 8, 1 September 1804 – 31 January 1805 and supplement 1776 – 23 June 1804, ed. Mary A. Hackett, J. C. A. Stagg, Mary Parke Johnson, Anne Mandeville Colony, Angela Kreider, Jeanne Kerr Cross, and Wendy Ellen Perry. Charlottesville: University of Virginia Press, 2007, p. 378. “To James Madison from James Leander Cathcart, 13 August 1810 (Abstract),” Founders Online, National Archives (http://founders.archives.gov/documents/Madison/03-02-02-0594, ver. 2014-05-09). Source: The Papers of James Madison, Presidential Series, vol. 2, 1 October 1809–2 November 1810, ed. J. C. A. Stagg, Jeanne Kerr Cross, and Susan Holbrook Perdue. Charlottesville: University Press of Virginia, 1992, p. 483. 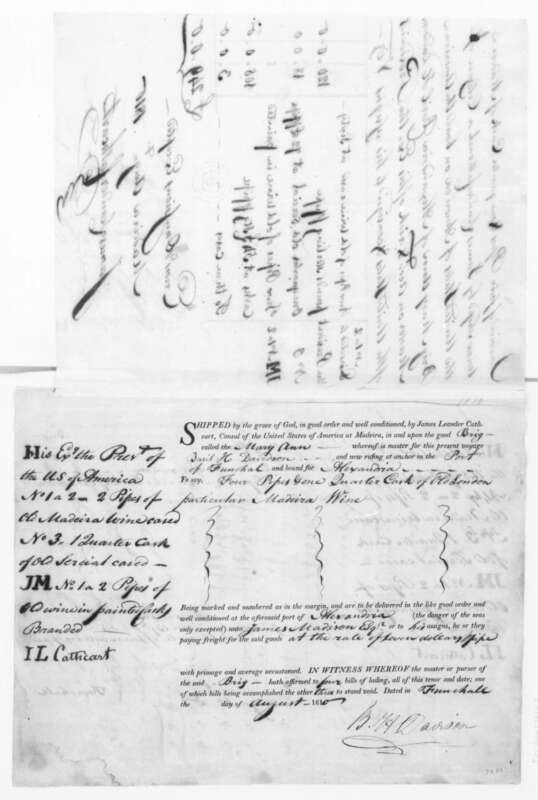 “From James Madison to James Leander Cathcart, 28 May 1811 (Abstract),” Founders Online, National Archives (http://founders.archives.gov/documents/Madison/03-03-02-0371, ver. 2014-05-09). Source: The Papers of James Madison, Presidential Series, vol. 3, 3 November 1810–4 November 1811, ed. J. C. A. Stagg, Jeanne Kerr Cross, and Susan Holbrook Perdue. Charlottesville: University Press of Virginia, 1996, p. 320. “To James Madison from William Lee, 20 June 1804 (Abstract),” Founders Online, National Archives (http://founders.archives.gov/documents/Madison/02-07-02-0356, ver. 2014-05-09). Source: The Papers of James Madison, Secretary of State Series, vol. 7, 2 April–31 August 1804, ed. David B. Mattern, J. C. A. Stagg, Ellen J. Barber, Anne Mandeville Colony, Angela Kreider, and Jeanne Kerr Cross. Charlottesville: University of Virginia Press, 2005, pp. 344–345. Per email correspondence March 31, 2014. Thanks to Elizabeth Gabay MW for pointing out the connection between wafer and a red wax seal. Philadelphia, July 9. 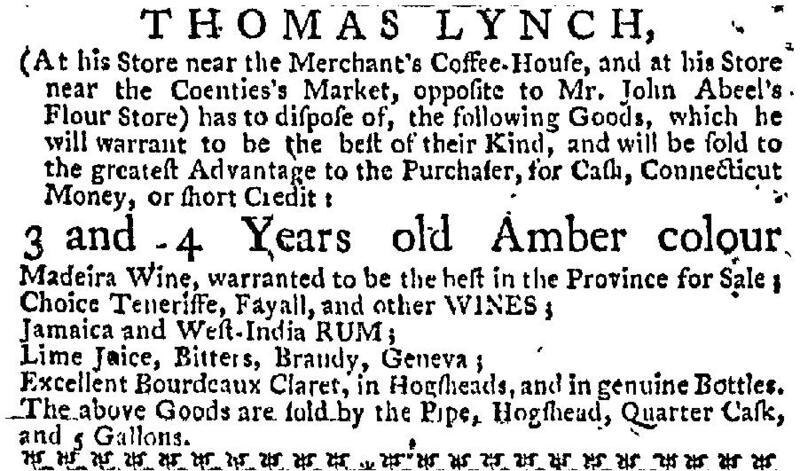 Date: Friday, July 9, 1779 Paper: Pennsylvania Evening Post (Philadelphia, PA) Volume: V Issue: 613 Page: 178. Genealogy Bank.